For over four years now, I’ve made pretty much all the bread we eat in this house. Yes, sometimes we splurge on a fancy “artisan” bread, but generally we eat homemade. Over the years I’ve worked to improve our diet, whenever and wherever possible. Homegrown and/or organic veggies. Free range farm eggs. Natural peanut butter. Grassfed meats. Standard grocery store bread is pretty tasteless at best, and many of the ingredients are unpronounceable. Not to mention that it’s terribly expensive for what it is, and we never seemed to eat it before it went stale, leaving me feeling like I was throwing money away. I’d tried making bread in the past, by hand and with the bread machine, but I’d never been pleased with the results. My “handmade” loaves were dense and uneven, and the loaves the machine turned out were strangely shaped and had hard, thick crusts. I don’t know where I came up with the idea to use the bread machine to mix and knead the dough, but then rise it in a regular loaf pan and finish it in the oven. Did I read it? Dream it? Did someone suggest it? Anyway, this was the technique I tried, and voila! Success at last! I’ve used this method to make “French” bread, dinner rolls, and challah, but most often, I make standard, multi-purpose, everyday bread. My Failproof Bread. Everyone loves this bread, anyone can make it, and it can be used for almost any purpose. This is the bread we eat for toast, sandwiches, hamburger and hotdog “buns,” french toast, bread pudding, bread and butter, and so on. I also give it to friends, bring it to dinner parties, and barter it for food I can’t grow, like fresh milk. ♦ sweetener–here’s where you get creative and personal: anything goes! I’ve used white sugar, dark brown sugar, light brown sugar, maple syrup, and honey–they all work. I most love dark, local maple syrup or fresh golden honey from my friend Sigrid’s bees, but you can choose what works for you. I don’t even measure, really. If I’m using sugar, I pull out a tablespoon (the large spoons that came in my wedding flatware set) and dump in somewhere between 2 and 4 spoonfuls, sometimes heaping, sometimes not. For liquid sweeteners, I just kind of drizzle it in. I would guess that I usually use about 1/8 of a cup, but I’ve gotten closer to 1/4 cup sometimes. That makes a slightly sweeter bread, but the boys in this house don’t mind! The thing about sweetener is that you need it to help the yeast work, but your tastes and commodities at hand can determine the rest. 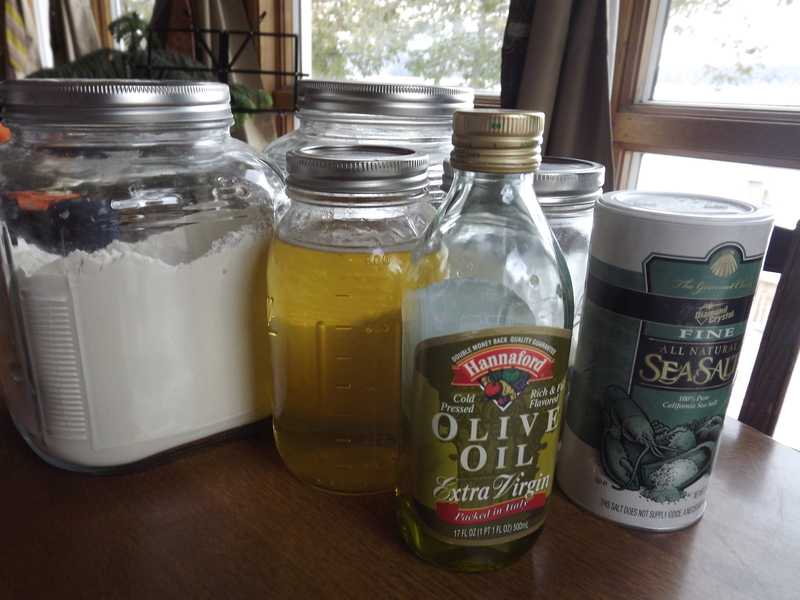 ♦ good sized glug of olive oil–again, mix it up! 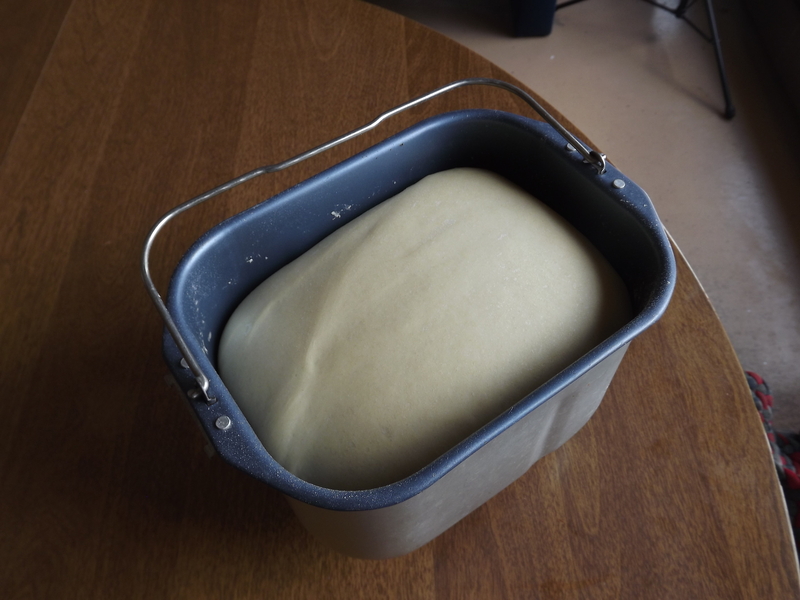 Technically, you can leave the oil out, but the dough and bread are smoother and softer if you use it. 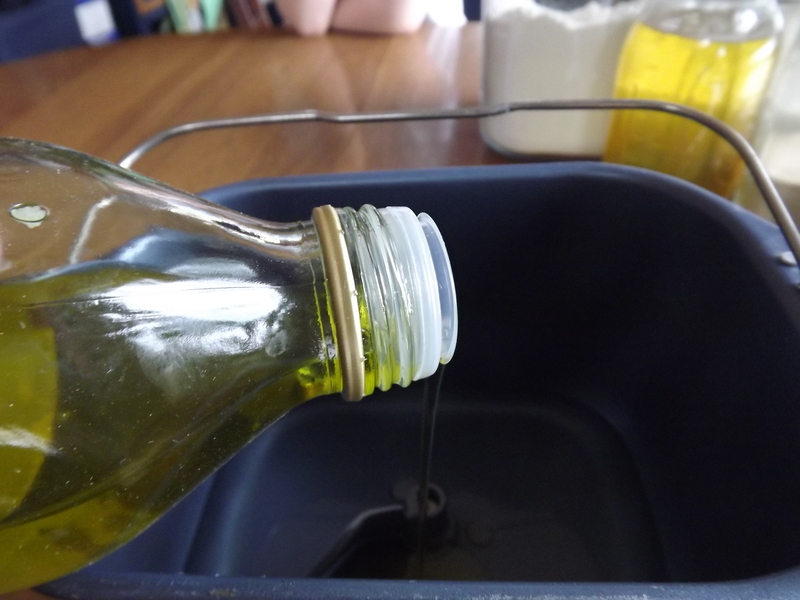 I most often use olive oil, and again, I just glug it in–maybe 1-3 Tbsp. I have also used coconut oil, in about the same quantity, and I bet you could use most any oil–peanut, grapeseed, avocado. The sky’s the limit! ♦ 3 cups of flour–and here I’ll get a bit preachy. I have tried a lot of flour, and there is no doubt in my mind that King Arthur flours are the best. 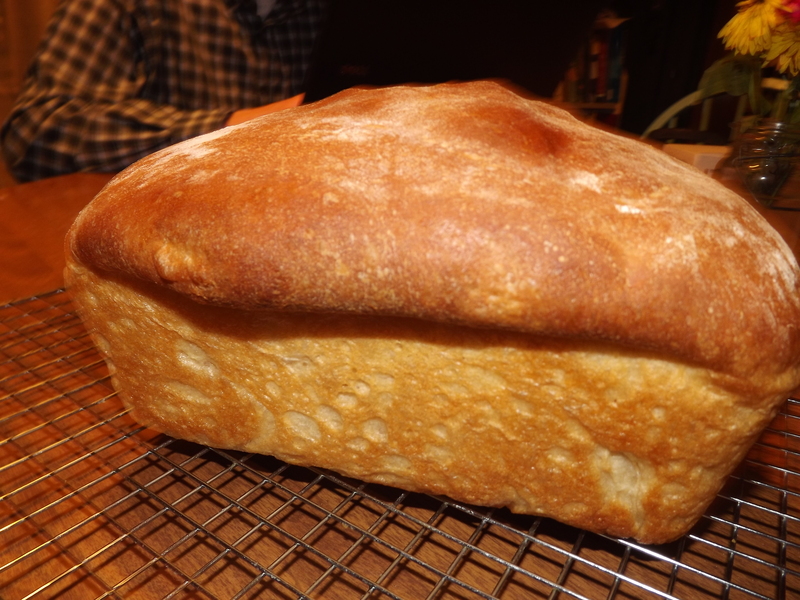 Additionally, you want to use a bread flour–it’s got more of the good gluten-y stuff that helps the bread become bread. But I still mix it up a bit. 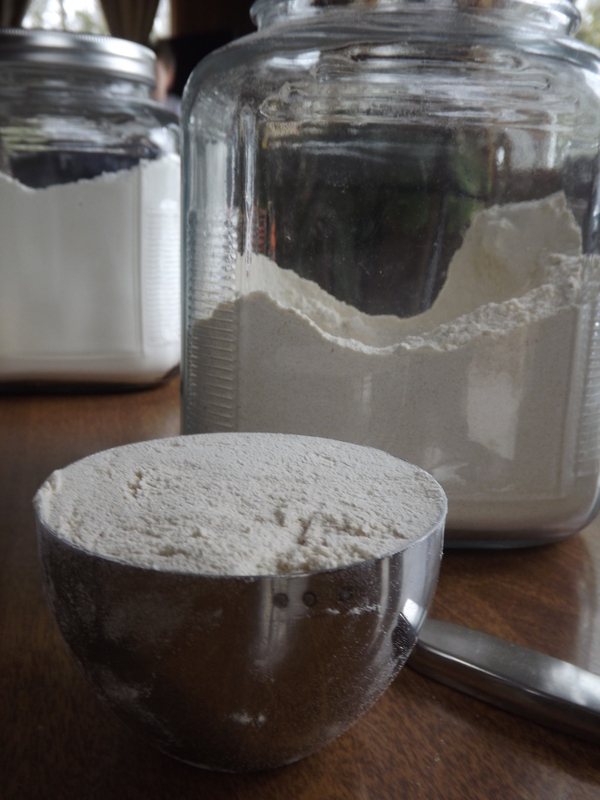 I usually use 1 and 1/2 or 2 cups of King Arthur unbleached bread flour, and then the remaining 1- 1 and 1/2 cups one or a combination of the following (all King Arthur): bread flour, white whole wheat, whole wheat, rye flour, and Ancient Grains blend. My go-to ratio is 2 c. bread flour, 1 c. white whole wheat. ♦ yeast–again, I don’t really measure. I use the smaller spoons from my wedding set, and add somewhere between 1 level and 1 heaping spoonful. 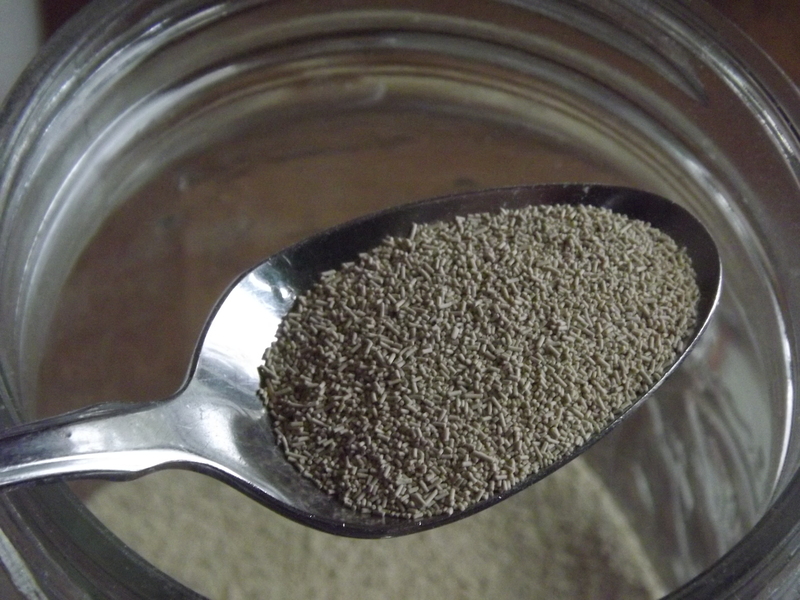 I bake often, so I buy these bricks of yeast and store it in a mason jar in the fridge between uses. ♦ OPTIONAL– I often add one or more of the following: ground flax meal, chia seeds, wheat bran, Italian seasoning, shredded cheese, etc. You can do this, and *you* can determine what you add and how much. Dump it in there before the flour, unless it’s cheese, in which case you should add it after the first rise (see below). My bread machine is older than old. Honestly, I’ve had it for over 10 years now, but this is the more recent version of what I use. 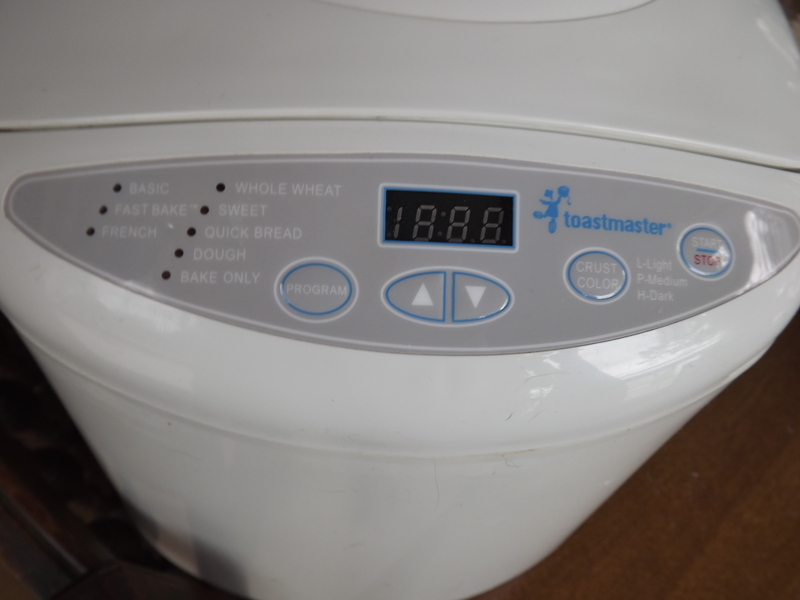 Any bread maker should work, as long as it has a “Dough” cycle. I add the ingredients to the pan in the order presented, with one exception. 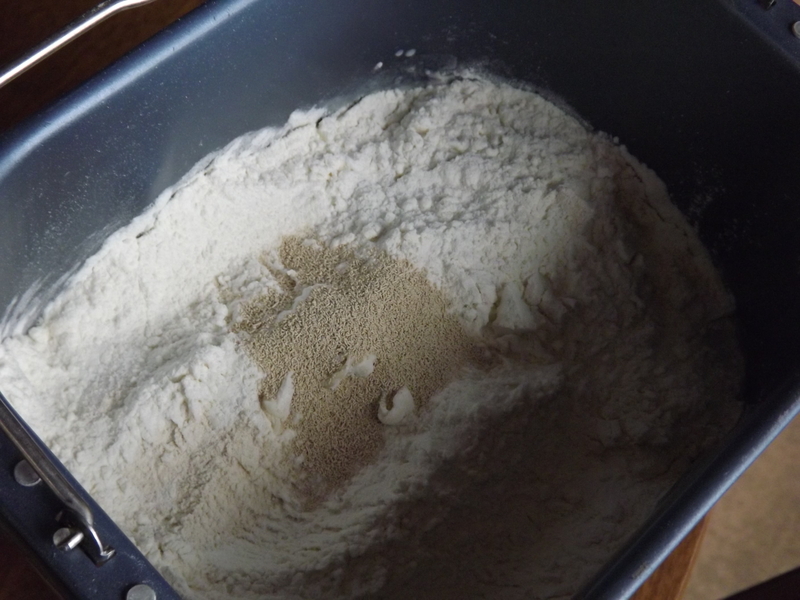 After I dump in the flour, I use a spoon to level off the ingredients, then add the yeast. 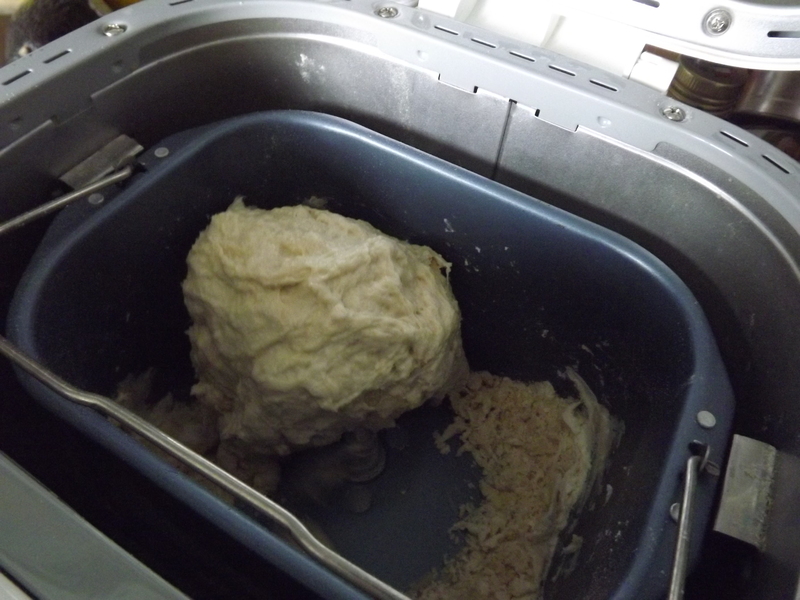 Then I set my machine to the “Dough” cycle, and turn it on. The machine mixes and kneads for a while (your machine’s User Manual probably tells you how long), then rises briefly, kneads again, then rises for nearly an hour. 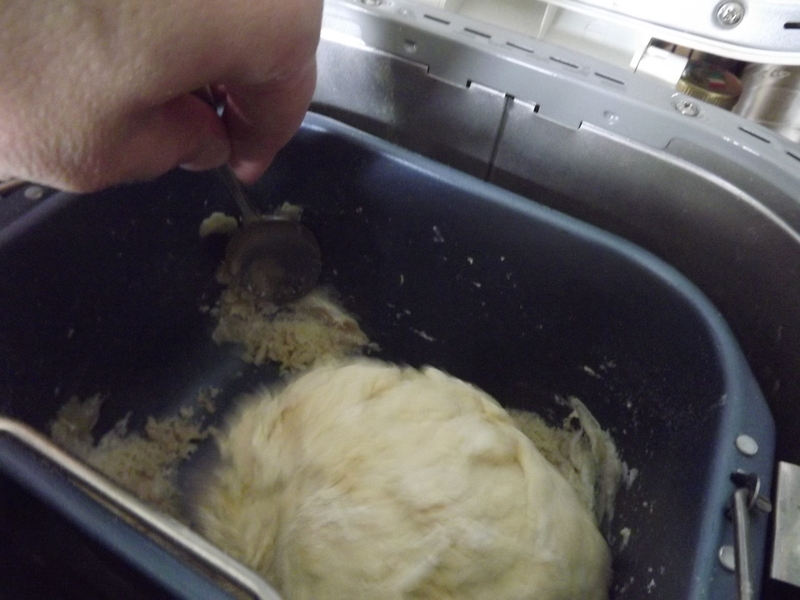 I watch it during the mixing and kneading phase, to be sure the ingredients are well mixed and forming a ball of dough. 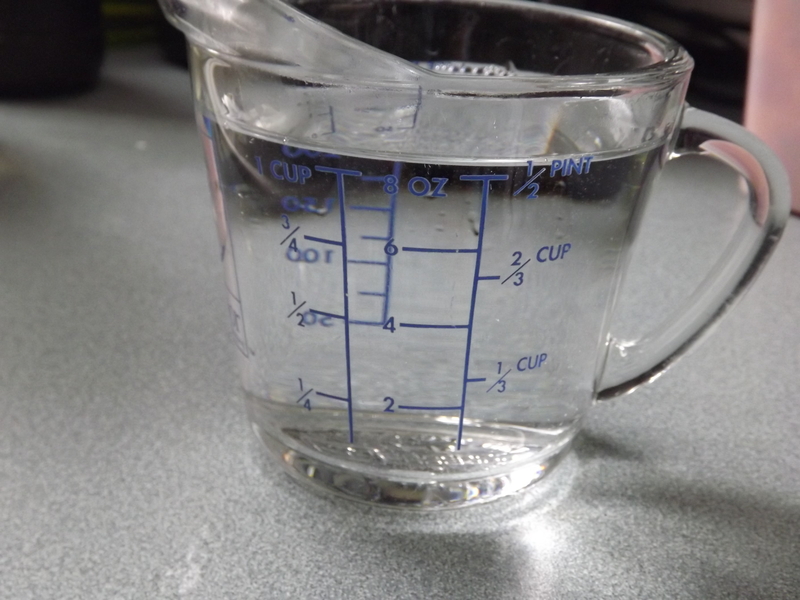 Often, I need to add a bit more water (a little at a time, no more than 1/4 cup) to make this happen. 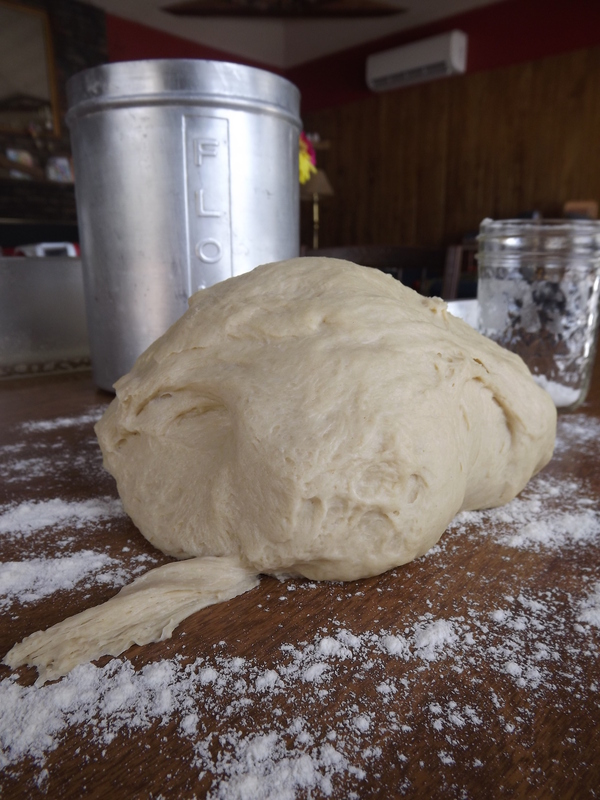 In general, a softer, wetter dough makes a nicer loaf than a stiff hard dough, so adding water isn’t a bad thing, as long as your dough isn’t soupy or liquid. When I’m satisfied that all ingredients are incorporated into the dough ball, I leave it alone. This is the time when I: run a load of laundry, run a load of dishes, supervise some homeschooling, break up a couple fights, walk the dog, zip out to the general store, sweep the floors, eat supper with my family, check my email and Pinterest accounts, scrub the toilet, work on a project in-progress, or some combination of any/all of the above. When the machine beeps, look in and check out your risen dough. It needs to at least double in size, but I find the bigger it gets, the better. I often leave it in the machine (turned off) for up to twice the rise time, just to get some air in there. 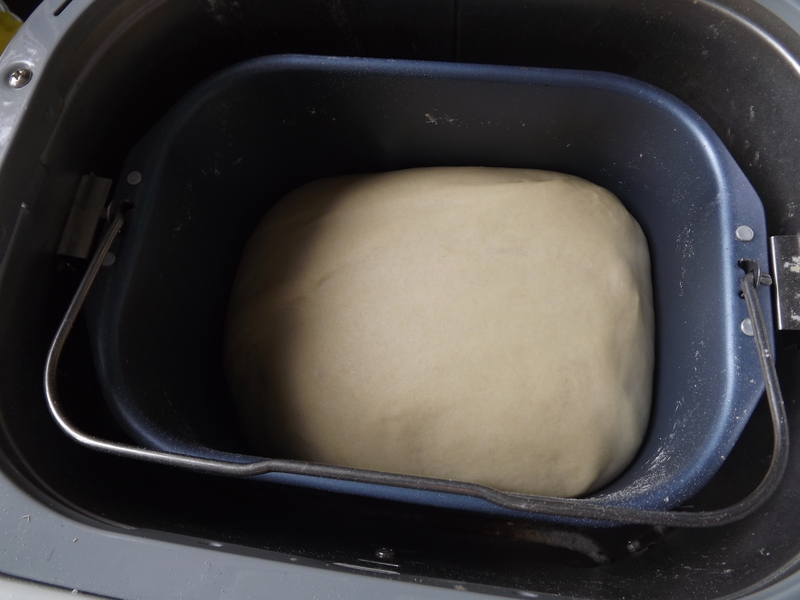 If it looks big enough to you, turn the machine on again, and let the kneading paddle knock down your dough. 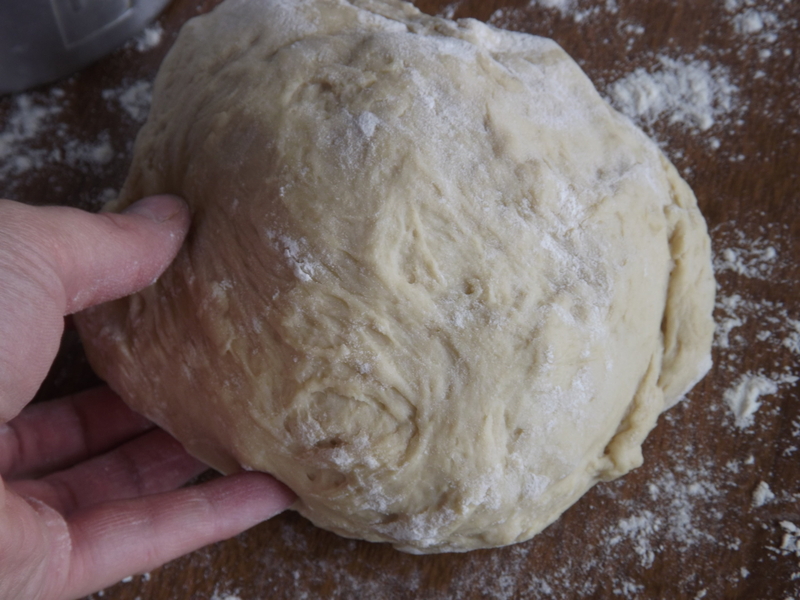 When it has re-formed itself as a solid dough ball, dump it out on a lightly floured (all-purpose is fine) surface. Double check to make sure your bread maker paddle didn’t exit with your dough (mine does this *all* the time). 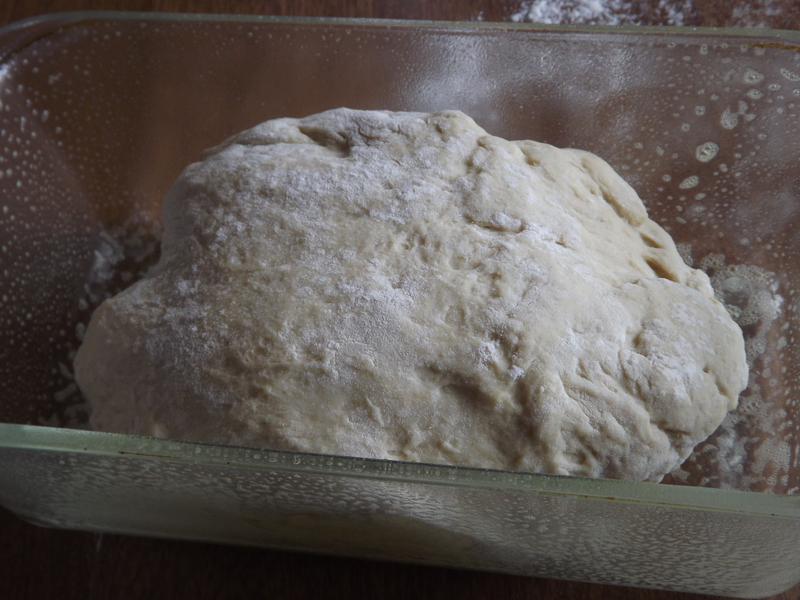 Gently toss the dough around in the flour until it is no longer sticky. 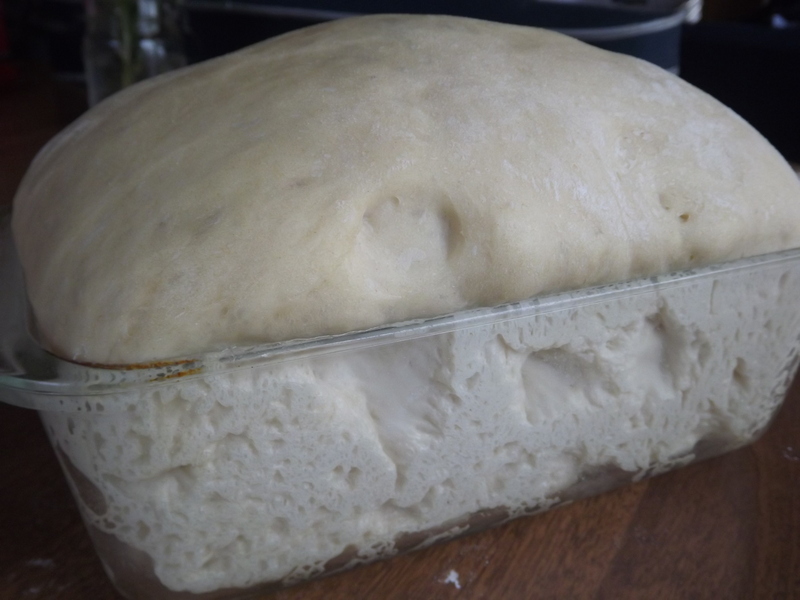 Plop your lump of dough (no need to “shape” it) in a greased loaf pan. Grease it as you choose–I sometimes use butter, sometimes olive oil, and often Pam Baking spray, because it’s easy. Cover the dough with a clean dry dish towel and let it rise in a warm place for 45 minutes, or until at least double in size. 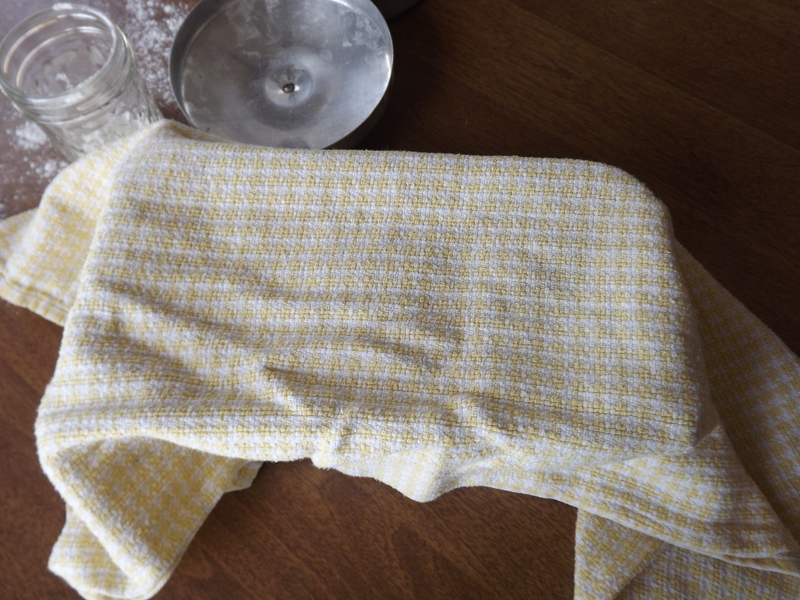 Remove dish towel and bake in a 350° oven for 25 minutes. 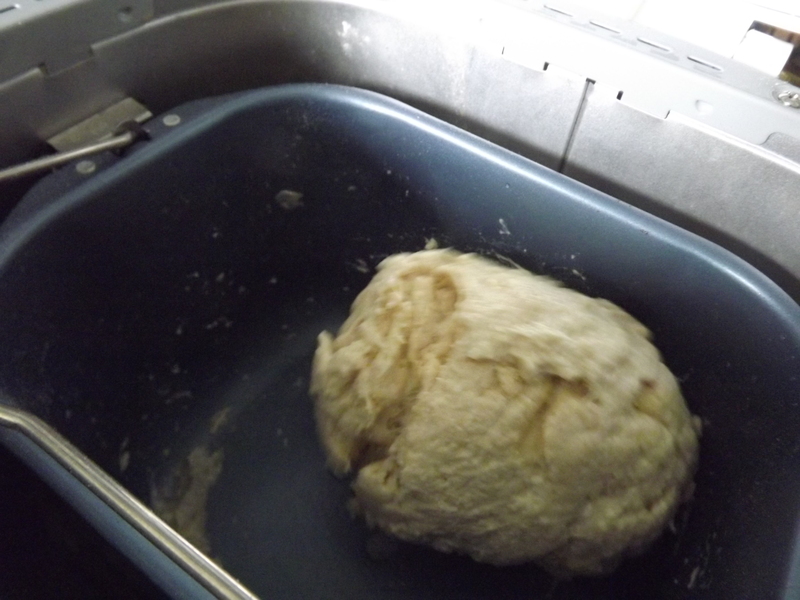 Check loaf–if it is golden to medium brown all around, remove to wire rack and dump out of loaf pan. If necessary, bake longer, checking every few minutes. Allow to cool before slicing, but not too much, because almost nothing is better than fresh warm homemade bread and butter. I always keep my bread soft by storing it in a large ziplock bag once it is completely cool, but I’m researching other, more environmentally and health friendly options (like these pretty bags from Fresh Eggs Daily). Either way, if your family is anything like mine, you won’t need to store it for long, if at all. Sometimes, a loaf doesn’t even last a day around here! I’ve been wanting to try making my own yogurt. I’ll look forward to hearing how your bread turns out!